Let's washy washy clean - It's Global Handwashing Day! When it comes to outdoor play, Angel has never been the girly type of girl. A girly girl screams at the sight of creepy crawlies; she picks them up with fascination and whispers to them. A girly girl is afraid of getting grubby and tiptoes on sand; she holds it, throws it and rolls in it. A girly girl chases after butterflies in the field; she prefers to run after a ball, kick it and then fall all over it. A girly girl likes to hug anything cute, sweet and feminine; she likes to come close to anything that is furry, hairy and has legs. While I fully embrace her audacity, after all she takes after us, I do think I can do more to keep her safe in her adventures. Now that we are preparing for our return to the sunny island and she is going to have a 360-degree change in environment, it has struck me that I cannot continue to take good health for granted and assume that my child will not get sick from her everyday activities. Just thinking about the rampant outbreak of Hand, foot and mouth disease (HMFD) gives me the goose bumps. Good personal hygiene is the first step to achieving good health. As such, we're making it a point to learn and cultivate the most basic but important hygiene habit - Handwashing. - Every year, more than 2 million children don’t live to see their 5th birthday due to diseases like diarrhea and pneumonia. - Washing hands with soap and water reduces germ count by up to 99%. All it takes is 30 seconds. Now here comes the question: Do you know the proper way to wash your hands? Fear not if you don't, for Angel has mastered it by watching the Washy Washy Clean clip, so now she's going to teach you how with 8 easy steps in this instructional video. I guess, she's not going to have any excuse to say "Mummy, I don't know how to wash my hands!" from now on. In case you're wondering who's that shrieky-voiced lead singer and angelic background vocalist, *ahem* yes it's us. You see, handwashing can be fun after all! Help a child reach 5! For the 5th consecutive year, Lifebuoy will work with the Millennium Villages Initiative to bring hygiene education to children across 10 countries in Africa. This campaign hopes to save young children from potentially fatal diseases which are resulted from poor hand hygiene. Now you can do your part in saving lives! All you need to do is to pledge on Lifebuoy’s Global Handwashing Day Facebook page by simply clicking on 'Like'. With each pledge, Lifebuoy will commit to teaching a child hygiene education to help them reach the age of 5. You don't have to be a mum to want to protect children and save lives. All it needs is a compassionate heart. 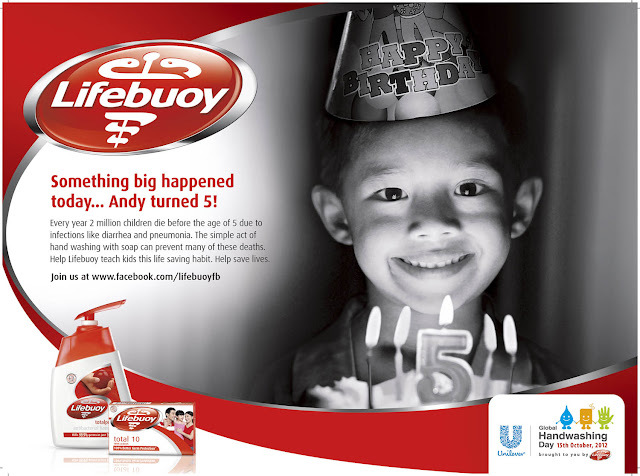 *Disclosure: This is an advertorial in collaboration with Lifebuoy. All opinions are my own. Nice video.. and she's such a cutie! Nice topic summer.